Sunrise Park on the afternoon of Easter Sunday, in April. The structures will be removed and the playground replaced. Albany’s Sunrise Park will get a parking lot and a big sun shade, plus two new play structures, according to a site plan for the park’s renovation that has just been filed with the city Planning Division. Neighbors have until Sept. 19 to comment on the plan, of which they have been notified if they own property within 300 feet of the park’s boundary. Approval of the site plan is up to the planning staff. The park’s playground will be removed and replaced with a new one at the north end of the site. Also at the north end, with access from Thurston Street, there will be a parking lot with 15 spaces. The site plan was submitted by the city parks department and the Greater Albany Public Schools. 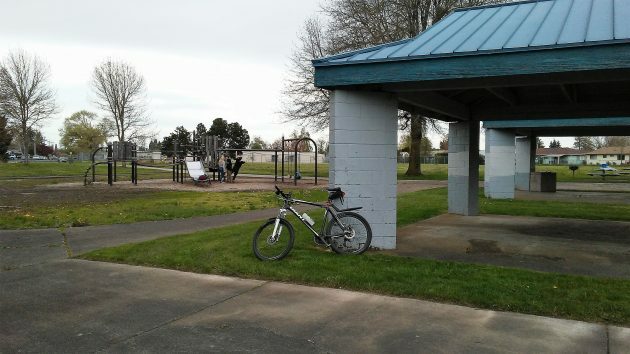 GAPS still owns the park but is turning it over to the city as part of a larger transaction involving other park land and a site for a new elementary school near Timber Ridge. The park renovation has been in the works since 2013 as part of Albany’s plan to use federal antipoverty grant money. The grant program allocated $239,000 to the project in its budget for 2017-18. Part of the federal program’s purpose is to reduce “blighting influences in low- and moderate-income neighborhoods,” a description that fits census tract 208 in the Sunrise Neighborhood. The city already paid $38,000 in grant funds to a Eugene wetlands bank in order to make up for the loss of so-called wetlands inside the park. Whatever its considerable merits otherwise, this makes the Sunrise project an example of the nuttiness of the wetlands program. I am sorry to hear the south-side playground might be removed since that end of the park needs play facilities. I took my daughter (by wagon) to that park twice a day many years ago. Isn’t there playground enough at Sunrise School on the north side?